Published un-numbered as the 20th issue in the American Science Fiction magazine series (Australia: Malian Press) in about December 1953, with stylistically simple artwork by Stanley Pitt, this issue packs a hefty punch, with two very competently-written short stories to chase the thrilling novelette by Carr. 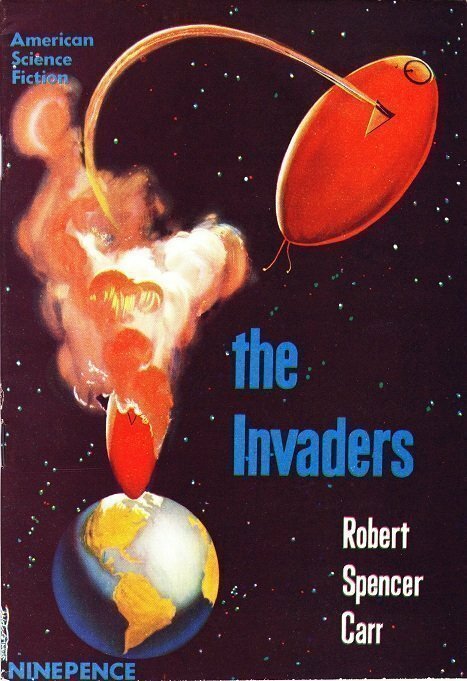 The title seems to imply a slew of aliens invade our planet, but, in fact, we are looking only at two Martians. Operating on a shared-mind system, they fly about in red-egg-shaped ships. One lands in Washington D.C., while another lands in Moscow. After reported attempts to blast the ship(s) to pieces, both country leaders learn that an impenetrable H.G. Wells’ War of the Worlds-like shield protects them from assault. The alien in each vessel finally contacts each country’s leader, and negotiations begin for coming to live here on Earth. But, each country wants the vessels abilities to counteract war and/or to annihilate their enemy. The alien in Moscow agrees to the deals made there without his “brother’s” agreement, which goes against every Martian code and silences their joint contact. This results in an aerial Martian war between the two all across the skies of America. Finally, one wins, and departs for Mars. It ends on a note that suggests the D. C. visitor won, as a very human-like victory lap is performed over D.C. The magazine is securely finished with John D. MacDonald’s short thriller Flaw. Imagine if going into space resulted in your returning a year later the size of the 50 Foot Woman. Just so, the four space pioneers return and slam into earth and die. The narrator has figured out the “why” and figures it is only a matter of time before scientists on earth eventually learn, but, in the meantime, the third exploration ship is due back in three months… and how big a crater will they create on re-entry? The drop-down menu (located upper right screen) hosts further options and categories (scroll down) or you may just search, for example “gangster” digests. I’d love to hear your thoughts.